“Are you Vietnamese?” asked the young Namibian woman tasked at immigration with taking my temperature. I was surprised by her question, but later she clarified she had asked it because of my hat. Keeping the sun off one’s face and neck is always a challenge. For many years on the bike, I have worn a peak, unusually wide and strong, which does a relatively good job. The olive green canvas that covered it originally finally disintegrated and just before departing Johannesburg I had it recovered in gray. Sadly, my hair is no longer thick enough to prevent the sun burning my scalp, and in the early morning or late afternoon, when the sun is low, my cheeks and neck are exposed. On previous trips, I have worn a scarf under the hat, but this trip I decided to add a top to the peak. While in Springbok, I bought a large floppy straw hat at Mr Price, cut the rim off and super-glued the top to my peak. The peak now looks a little like an Easter bonnet, and me rather ditsy, but it serves an essential purpose. 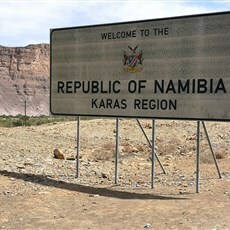 The Namibian official equated the fabric and texture with Vietnam. From Hollywood Guest House in Steinkopf, we made our way under the N7 to a truck stop open 24/7 and there stocked up on water for our 70km ride to the South African border at Vioolsdrif, and departed the truck stop under a full moon. We had long, gentle inclines for the first 8km to a cell tower on a hill beside road; and later in the day another climb to another tower. 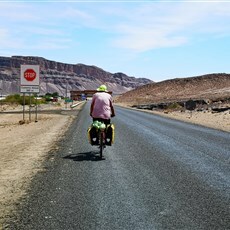 But on the whole it was a downhill ride to the Orange River that separates South Africa and Namibia. A magical ride during which gravity dragged us inevitably to the Orange and a new country. Dragged us along the yellow line that delineates the lane from the shoulder. Dragged us through an extraordinary landscape, almost otherworldly, tiny quartz glinting like diamonds in the veld. The white lines of planes passing overhead, etched across a blue sky. It was very hot by the time we reached Vioolsdrif. We bought a lunch of Russians and chips at the only shop on the road, and sat under the only tree to consume it. Others had sat there before us, leaving behind broken glass bottles and empty plastic bottles and other litter, but the shade had too strong an attraction for us to be put off by the dirt. Leaving South Africa was easy and friendly - a big contrast to the horrors of the South African / Zimbabwean crossing. I explained to the woman with the stamp that we would be passing through 22 countries and needed to conserve space in our passports, and she obligingly put a neat exit stamp top left on page one. 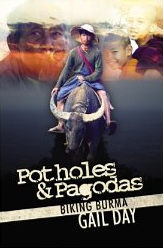 And the customs man had seen us on the road a day or two before and was happy to make our acquaintance. 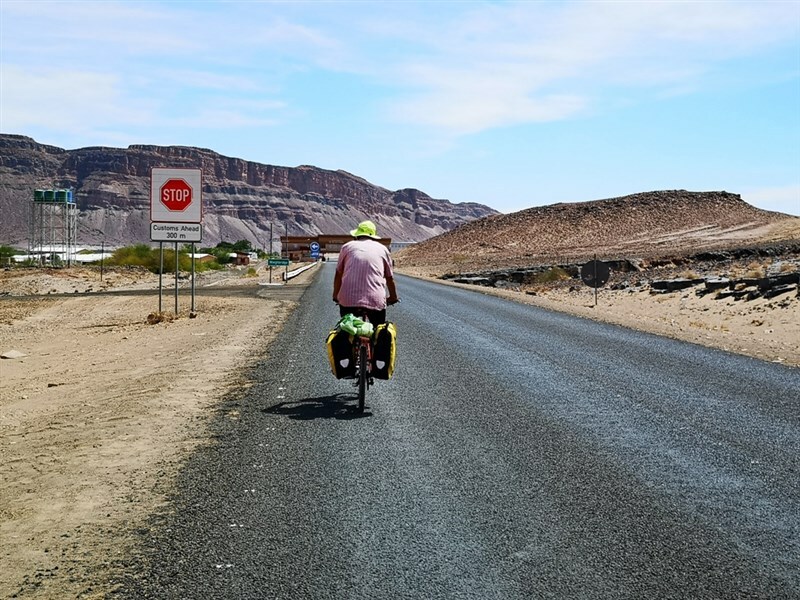 We cycled then across the Orange and into a new country (Charl has been in Windhoek on business on a couple of occasions, but this is a first for me). Taking a photo from the bridge of the greenery along the river, we saw a man standing thigh deep in the water catch a fish with a handline. 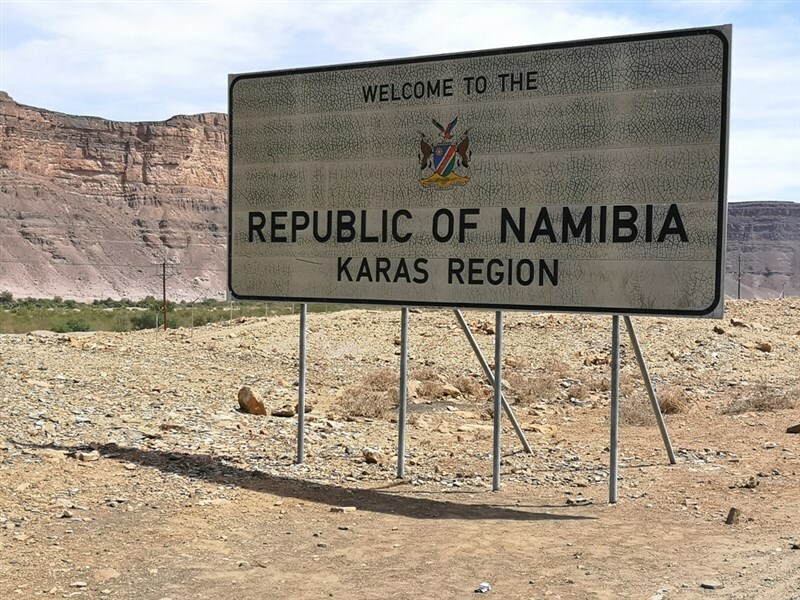 The immigration official on the Namibian side of the border was a more “typical” bureaucrat, a little unfriendly, a little officious, but she stamped us in with much ado, and we were back on the road. There is not much accommodation in Noordoewer, the first town north of the border, so we settled for the budget busting, but delightful Noordoewer Guest House. An aircon room with wifi; a pool in which we had a swim; flamboyant trees shading the garden, blooming red; three white geese waddling about under the garden sprinklers; a dalmation pup; and an excellent dinner. Heaven.